As a runner, I know what having tight calf muscles is like. Calf muscles are used a lot during running so without proper stretching they tend to get very tight. Running isn’t the only thing that can make your calves tight—other exercises or even wearing high heels can cause tightness. When I started practicing yoga I took careful note of the poses that helped me get the best calf stretches and incorporated them into my home routine. Here, I’m sharing my top five yoga poses that are calf stretches. I hope they help you if you have tight calves, too! If you want to lengthen your tight calves, make sure to stretch and lengthen them regularly. You can use the yoga poses you see below, or any other calf stretch. You should also consider adding in some foam rolling or myofascial release. Those techniques can really help loosen any adhesions that are keeping your calves and ankles from finding their fullest flexibility. If you’re looking for a routine to follow, scroll down to the bottom of the page–you’ll find a 12-minute video that walks you through each of these calf stretches. Repeat it a few times a week and your calves will be feeling much happier. And, you won’t have to think about what to do next, so you can just turn your brain off and relax. Win-win! Let’s start out with Warrior I. You might not think of Warrior I as helping you lengthen your calves, but it does! Warrior I has always been a good calf stretch for me, and many of my students say the same thing. But, there are ways to slightly modify your Warrior I to feel the opening even more in your calves. I think the key to a good calf stretch is to make sure that your hips are square to the front of the room, even if that means bringing your feet closer together. So, if your left foot is forward, you’ll want to pull your right hip forward as well so it’s in line with your left. (You’ll really see this in the video below.) Your back toes are turned at a 45 degree angle, which helps you get in that good calf stretch, too. Making sure that you’re pressing through the outside of your foot just as much as the inside will help, too. Gorilla Pose is one of my favorite yoga poses that are calf stretches. The forward fold gives me a good stretch in the hamstrings. But, I love Gorilla because lifting up my toes really helps me feel an opening through the back of my legs, especially through my lower calves and ankles.. It’s okay to bend your knees as much as you need to in this pose to make sure you’re not straining any muscles. To come into Gorilla Pose, begin from a simple forward fold. Then, shift your weight to your heels and lift your toes slightly. Slide your hands under your toes so that the palms of your hands touch the soles of your feet. You can hang out here for a while if you like, even a couple of minutes. Just make sure to come up really slowly so you don’t pass out! Downward Facing Dog is probably the best known calf stretches that’s a yoga pose. It sets your body up in a way that just makes Down Dogs perfect calf stretches. 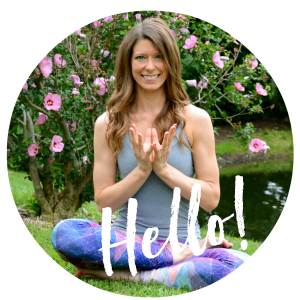 I like to start on all fours on my mat and make sure my hands are shoulder-width apart and my feet are about hip-width apart. Then, after I press myself up into the inverted V of Downward Facing Dog, I take a quick look at my thighs. I visualize where my leg bones are coming into my hip sockets, and I place my feet directly under those points. That helps me find my perfect hip width. You can see progress over time by paying attention how close you can get your heels to your mat. (But, if you’re a runner, or if you consistently do things that make your calves tighter or shorter like wearing heels, know your calves will re-tighten. That’s okay!) You can also warm up your legs and calves by bending your knees. Once the blood gets flowing, it can help you get your heels a little closer if you’re feeling stiff. If you don’t feel like standing to stretch your calves, try a Seated Forward Fold with a yoga strap. (Or, you can grab a belt or towel or pretty much anything that you can loop around your feet. This forward bend variation is a perfect stretch for the calves. To engage the calf muscles more, I’m using a strap to pull back on my toes. (This works best when the strap is looped around the ball of your foot.) Here, I’m worrying less about folding forward and more about flexing my foot to get in the good calf stretch. As you feel your calf muscles lengthen, you can walk your grip closer to your feet. Eagle Pose is less of a traditional calf stretch than the other poses, but it does stretch the calves a bit and really stretches the Achilles tendon, which runs from the calf to the heel. And, it gets a lot of the smaller tendons surrounding the back of the ankle, too. If those tendons are nice and limber, they will pull less on the calf muscle, helping the calves to not feel as tight. The lower you sink your seat toward your mat, the more you’ll feel why this is one of my favorite calf stretches. 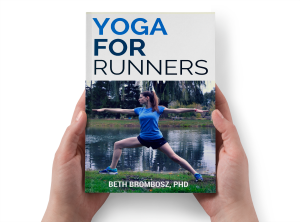 And, that’s why I incorporate Eagle Pose into a lot of my yoga for runners routines. Added bonus: with balancing poses, you’re using all of the tiny muscles in your feet and lower legs to hold your balance. Those stabilizing muscles are really important for helping prevent running injuries. When they’re strong, they can help prevent a simple misstep from becoming a sprained ankle, for example. So, throw some balancing poses into your routine regularly and you’ll be taking care of your lower body. Put these poses all together into a yoga sequence by following this video! If you’d love to try this sequence but you can’t come into a full Downward Facing Dog, consider bringing your hands to a sturdy chair or to a couple of yoga blocks. You may not feel as much of a stretch in your calves, but you’ll be protecting your upper body and wrists. You can also talk to a local yoga instructor about how to modify poses to fit your individual needs. They’ll be able to work with you to help you find modifications of poses that work for your body.